Antioxidants are made for the struggle and reconstruction of the damaged cells, because of their ability in destroying the free radicals. 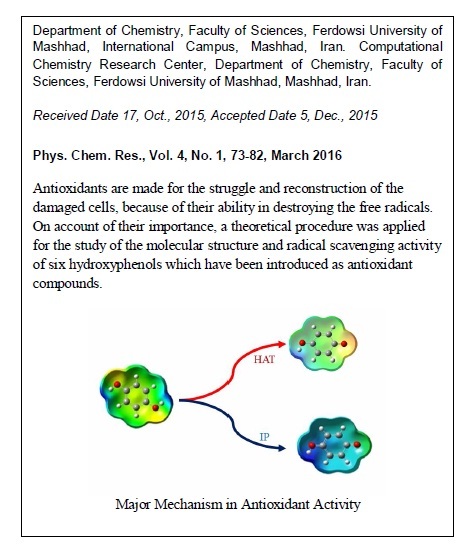 On account of their importance, a theoretical procedure was applied for the study of the molecular structure and radical scavenging activity of six hydroxyphenols which have been introduced as antioxidant compounds. All geometry structures were optimized by M06-2X, MPWB1K with 6-311++G (d, p) basis in the gas phase and solvent using the CPCM model. Three probable mechanisms for the antioxidant activities have been presented and analyzed. According to bond dissociation enthalpy (BDE) and ionization potential (IP) values, hydrogen atom transfer (HAT) mechanism is a more reasonable path for antioxidant activity. 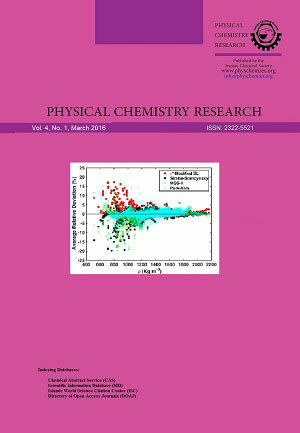 The contribution of the HOMO-LUMO orbitals and spin density distribution have been calculated for evaluating of the previous data. Finally, based on the comparison of the experimental and the calculated data, BDE mechanism showed the best agreement.